Today’s world and Gandhian Thought! By Tanveer Jafri : Amidst the atmosphere of tension, violence, differences of opinion, unemployment and inflation globally, today the question is being raised again and again about the relevance of Gandhian philosophy which is based on truth and non-violence. Anyhow, most of the people who oppose Gandhi’s thoughts unfortunately are Indians and not foreigners. These people did not feel the relevance of Gandhian thoughts even when he was alive. This feeling of disagreement with Gandhian philosophy resulted in his assassination. But people who had differences with Gandhi have begun to feel that Gandhi was not much harmful for his opponents being alive but he is more harmful after his death. The reason behind this is that the world is finding itself involved in violence, economic meltdown, starvation, unemployment and hatred. And the need for adopting Gandhian philosophy is being felt more eagerly everywhere. Why its relevance is being felt more actually today, we shall have to look at some of the incidents of recent history. The 9\11 terrorist attack on the United States of America changed the trend of the world politics. Anguished by alleged colonial and selfish foreign policies of America, the terrorists attacked the World Trade Centre, the landmark of New York, which was considered as a symbol of the prosperity of America and killed about five thousand persons. Really, it was a cruel and intolerable deed of the terrorists. Undoubtedly, the persons involved in such activities should be severely dealt with. The organizations and networks that inspire such wicked activities, certainly, need to be eliminated. After 9/11, the then American president George W bush II did somewhat like that. He assumed this terrorist attack as attack on the pride of America and President Bush declared a ‘War on Terror’. George Bush vowed at that time that world has two options- Either they are with me or with the terrorism. There is no third way out. Obviously, the most of the countries, who wanted peace in the world, took seriously, the time of trouble fallen on America and supported America on the call of President Bush. The countries that suffered from terrorism wanted to fight a decisive war against terrorism under the leadership of America. They wanted to get relief from the terror bite that had been pinching them for several decades. They wanted the world to live in peace. But all the assumptions and suppositions by the world dashed to the ground. After the declaration of war against terrorism by President Bush, the terrorism from the world could not be eliminated. The most dangerous terrorist, the most wanted criminal of the world, Osama Bin Laden is still at large. His terrorist organisation ‘Al Qaeda’ could not be eliminated. After the 9/11 attack, America first of all ousted the Taliban from Afghanistan. The Taliban that was accused of having alliance with Al Qaeda could not, undoubtedly, stand for long time before the NATO armies in Afghanistan. But within four years those Taliban again, organised and strengthened them self. Now once again, the American analysts feel that the area of Afghanistan is the most dangerous area of the world. On the other side, during that period President Bush, taking excuse of the declaration of war against terrorism, committed a blunder, and sent American armies in Iraq. Under the pretext, the American Army entered Iraq was that Saddam Hussein had a huge store weapons of mass destruction in Iraq. The American army not only entered Iraq but turned Iraq into a heap of ruins and Saddam Hussein was made to reach the gallows. He was tried in an Iraq court under a famous Dujail massacre case. The world was a passive spectator before the tricks of superpower America. Israel too had blessings of America. Under the pretext of terrorism, Israel too, whenever wanted, bombed Palestine. The reason that Israel told was the same, of the terrorism. A few years ago, Israel waged a war against the Hezbollah organization in Lebanon, declaring it as a terrorist organization. The result that appeared after the above violent incidents and the policy of Bush against terrorism is that Laden is still out of reach and other most wanted terrorists, Mullah Mohammad Omar and Aiman al- Zawahiri etc. are away from the grip of the American army. Instead the organizations attached to Al- Qaeda have got more strength. Many new terrorist organisations have sprung out. Even the Taliban, which once gave in before the American army, is being seen gathering more strength. The hold of the terrorists in the area of Pakistan-Afghanistan border has become so strong that Pakistan President Asif Ali Zardari had to admit that the terrorists have got strong hold on Pakistan. Pakistan itself is fighting for its existence and facing new challenges from the terrorists’ everyday. Last days, in the Swat valley on Pak-Afghan border, the Taliban played such a game that Pakistan and NATO armies had to kneel before their power. On the base of the power captured, the Taliban forced the Pakistan government to apply Sharia law in tribal area as desired by the extremist Taliban. This incident is being seen as a big victory of the Taliban over Pakistan. The Presidential election in America took place last November in the midst of the horrible and intolerable incidents that came out during the period of ‘war on terror’. The civilian deaths along with thousands of soldiers of American & its allies, the expenditure of billions of dollars, the economic recession in the world and unemployment, the worldwide dissatisfaction because of violation of human rights were contemporary. In the presidential election that took place in America, on one side, there was a candidate named John McCain who was favouring the aggressive policies of president Bush and on the other side was a non-white candidate Barack Hussein Obama, who was talking of the path of truth, peace and non- violence as told by Mahatma Gandhi. At last Barack Obama won the presidential election with a huge margin. The first non-white American President, Barack Obama took oath as the president on January20. It was a great revolutionary change in the politics in the America. Why the people of America got fed up by the policies of George Bush and followed Obama with one voice? Once again the question has arisen due to the revolutionary change, if the relevancy of the ideals of Mahatma Gandhi is required in this tensed atmosphere of terror. Regarding Obama, his life has been inspired by Mahatma Gandhi. Obama has fixed a portrait of Mahatma Gandhi in his office, where he is seen conveying the message of peace. Obama is impressed with those great philosophies of Gandhi in which Gandhi inspired the world society to face the crushing policies with peaceful ones. Obama accepts Gandhi as his idol and took inspiration from the picture of Gandhi in his office. He says that this picture of Gandhi always reminds him that true results don’t come from Washington but from the public. Obama says that Gandhi was to select an alternative while getting India free from the British rule, & he selected courage in place of fear. Obama, who talks of the Great change in the world & finds solution of the problems while following the path of non-violence, is feeling the relevance of Gandhian ideals in this age of violence & terrorism. An important question is from where did Gandhiji get this inspiration? Notwithstanding fragility, he stood fearlessly against injustice & the attribute of not to bow before the injustice, from where did he learn? From where did Obama himself get this inspiration? In fact this great idol, living embodiment of communal harmony, had studied the history of many religions & scriptures. The study of holy Gita had given him the inspiration to follow the path of religion based on Karma. At the same time, the Karbala incident of the Islamic history had impressed a lot to the life of Gandhiji. That was the incident of 680 B.C., happened in the city of Karbala in Iraq, on the bank of river Furat in which the then Syrian ruler Yazid mercilessly murdered Imam Hussein and 72 members of the family, with his huge army. In fact if Hussein had not left Medina and not come to Karbala, then the daring Yazid might have killed Imam Hussein and his relatives by going to Medina. But to the sanctity of Medina, Hussein himself left Medina even knowing that he along with his companions would be killed by the army of Yazid. Hussein, instead of kneeling before the cruel, powerful, wicked, arrogant, corrupt and characterless Yazid or agreeing with him any way, chose to be sacrificed along with his family members. Undoubtedly, the positive aspects that we see in Islam today that are accepted world wide, the sacrifice by Hussein in Karbala has great influence among them. As Hussein moved to Karbala to save Islam along with his group of 72 persons, in the same way Gandhi too, taking inspiration from that incident, took 72 persons from different groups of the society for his salt movement. Gandhi admitted that spread of Islam in the world is not because of the sword of the Muslim rulers but it is because of the sacrifice of the saints like Hussein. Gandhiji was so much impressed by the martyrdom of Hussein that he used to say, if he had only an army of 72 persons as like that of Hussein, he could have won the war of Indian Independence within only 24 hours. He used to say that if India wants to be a successful nation, it should follow the foot steps of Imam Hussein. Gandhi being a worshipper of non-violence clearly understood that violence is no solution for any problem. As the terrorism and violence are widespread in the world today, there seems relevance of Gandhian principles everywhere. Similarly Gandhiji talked of non-violence everywhere. Gandhi was in favour of using the thoughts against the arms and not the arms against the arms, to fight injustice and inequality. He gave an armament to the humanity in which there was no need to raise arms or make enemies. He believed in changing the society with his thoughts and not with the power or force. After the heavy destruction of property and lives in the World War II, when there was no good in the war, at last in 1945, the United Nations Organisation made declaration according to the thoughts of Gandhi. That was, ‘war is no solution to any problem so all problems should be solved through mutual discussions’. All the members of the UNO signed this peace proposal. Almost all the countries of the world including America are facing the severest economic recession since World War II. Gandhiji was against the big industries and was worried about the increasing industrialization. He used to call the set up of industrialization as ‘satanic set up’. Gandhi was of the opinion that the industrialization set up was based on the exploitation of man by man. The inequality will increase in the industrialization set up and there cannot be justice. Today the increasing unemployment in India and more industrialization has reminded the relevance of Gandhian thoughts. Including India in so many countries today, small scale industries, cottage industries and industries run by the workers are lying shut and the persons involved in such industries have been badly affected. Where ever such industries are running; the poor labourers, common man and the worker groups are hardly able to make both ends meet. In fact, Gandhi’s favour for the small scale industries had the main reason for it that Gandhiji always thought the benefit of the poor. He knew it very well that revolution in society or development can be brought only by providing the basic necessities of life to the poor. He also knew it that a poor man with bare body, starving of food, without a hut cannot think of independence or independence movement. Gandhiji always considered the welfare of the poor as the centre of the war of independence. Here it is not wrong to say that for the welfare of the poor, the thoughts of communism are almost the same as of Gandhiji. Even the revolutionaries who had sacrificed everything in the war of independence talked about the welfare of the poor. That is why, the main slogan in the war of independence was that wealth and land will get proper division. Gandhiji had strong desire for the uplift of the poor. It can be valued from the fact that he sacrificed his everything. When Gandhi started to work as a lawyer in South Africa after passing his studies of law, within a short span of time he was counted among the eminent lawyers of South Africa. Obviously this fame came to the man who was dutiful, intelligent and was going to be the base of the future of Independent India, within a few years. In 1905, Gandhiji used to earn the amount of 5000 by practicing as a lawyer in the courts in Africa. Certainly it is a by amount if compared to the present time, because at that time, the cost of gold was about 70 gram per pound. So it can be said that in terms of income, Gandhiji was a successful and rich lawyer. Obviously, he did not lack money and comfort and luxury at that time. But the fact was that notwithstanding all these things, a flame of struggle against injustice was blazing in that great soul. This fire was for raising voice against inequality and injustice. The fire was to abolish colour discrimination and to free India from the chains of slavery. This thinking of Gandhi gave him inspiration to leave his coat, pent, tie and suit and to live like a poor among the poor. He wrapped a piece of cloth around his loin that was known as dhoti. And then Gandhiji said that he would not accept anything until the poor in his country got every thing. Gandhi knew it very well that the real soul of India lives in the villages. Until and unless the villages are not developed the real development of the country is meaningless. 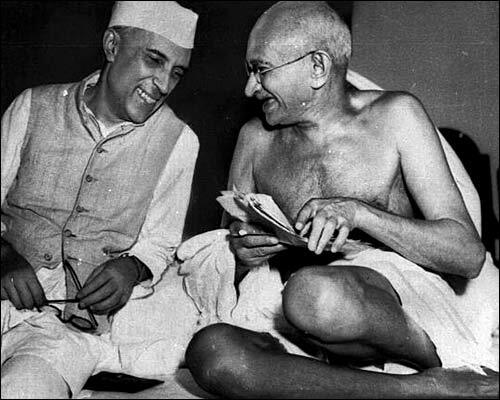 After getting independence, Gandhi asked Pundit Jawaharlal Nehru to look on the villages of India. The villages must be prepared for the economic development of the country. Gandhi thought that besides the establishment of heavy industries, the second level must be saved and this second level was of the rural economy. It is a different issue whether the rulers after the independence gave any notice to the words of Gandhi or not. But prime minster Dr. Manmohan Singh seems to speak the words of Gandhi. Manmohan Singh has repeated it time and again and even declared such projects at the national level that are concerned with development of villagers and villages. Such policies of Indian government also show that once again the relevance of Gandhian philosophy is being thought of. Gandhi wanted to make the younger children self dependent. So he was in favour of ‘Shramdaan’ (Voluntary Labour). I remember when I was in school, there used to be a separate period for gardening in the school. In that period all the students of the class went to the garden/farm of the school and worked there in the garden just like a gardener or a farmer. Even the Persian wheel that was run with hard labour was worked on by the boys. This education was according to the teaching and inspiration given by Gandhi. Its motive was that students should learn to be self dependent and learn voluntary labour contribution for the cause of public interest (Shramdaan). They should learn the dignity of labour and if need arises, they should be able to do farming themselves. They should be able to help in construction of bridges, dams, tanks, roads, streets etc. But it is a matter of sorrow that ‘shramdaan’ has become a thing of past days. Computer has taken the place of gardening these days. In the name of modern education, man is on the present path of development but physically a student of today is becoming lethargic. Computer education and the present modern science technology might have helped to control the whole world through a mouse, but the child who has taken hold of the world, certainly seems careless about the basic necessities around. The lack of mentality of ‘shramdaan’ in the society is making the society completely dependent on the government set up. Here we feel no need to explain the conditions how the government machinery works. When we are talking about the ‘shramdaan’, one thing is to be cleared that in India, there are many NGOs that are expert in making bridges, dams, roads, river projects etc. But if we have a look over the vastness of the country, the attraction that ‘shramdaan’ should have is not there. Interesting the government machinery is unable to ignore this formula of Gandhi completely. That’s why we, often see the pictures of the VIPs being published or broadcast, in which they are shown being intentionally photographed doing Voluntary Labour. Last days, in India the government of Madhya Pradesh has started a state wide project, following the principles of Gandhi based on Voluntary Labour. Because of the increasing scarcity of water in the state, the state government got started the renovation of a famous lake in Bhopal, following the Voluntary Labour principle of Gandhi. In this voluntary labour programme of very big scale, the Chief Minister of the state, officers, artists, journalists, social workers & the common people of all religions & communities took part actively. The state government has marked many old lakes & tanks in the state that are to be made reusable through Voluntary Labour. Undoubtedly, the government machinery is also giving its full contribution. But the concept of ‘shramdaan’ is itself a witness of the fact that Gandhi is not only remembered by the people of our country but by the people of the world also if need arises & there will remain relevance of Gandhian thoughts. Gandhi who taught the world to defeat violence by non-violence, was himself inspired by the holy Gita. He was too much impressed by the principle of Karma that has been said in the message from the holy Gita. Gandhi used to explain the well known sentence in the holy Gita- ‘Go on with your work & don’t worry about the reward’. In fact, today, in every sphere of life, we feel need for the relevance of this detail. Gandhi, who was too much impressed by the holy Gita, certainly would have got inspiration of knowledge & devotion from the holy Gita. The knowledge that he got about the importance of action without any expectation, is most important. ‘Work or action & don’t worry about the results’ is the teaching from the holy Gita that Gandhi wanted to make the world understand. In fact, a person must have knowledge about the objectives of the action while doing his labour. But if the work is done keeping in view of the motive as the centre, then the doer will indulge in the subject. In such situation, the doer, by ignoring the work being done, blindly follows the direction of the fruit to be achieved. He doesn’t hesitate to adopt the wrong path. The result of this thought can be seen especially with the people who are linked with the politics. Today, people who are active in politics, mainly have the motive of gains by getting political power. The so said political leader should have got power for social service or issues for development & progress or for eradication of illiteracy & unemployment, for providing health services or for giving basic amenities like roads, electricity and water. For these, they should go among the voters & get support for the works done by them. Exactly opposite, now there are attempts to get the power as ‘fruit’ without doing any labour. The result of this shortcut adoption is that communalism and corruption is flourishing throughout India. Many other countries of the world are also feeling the heat of communalism & casteism. At some places, communal riots are instigated just for communal polarisation and thus to make easy & early way to power. At some places, differences of language, caste & creed are spread. At present, some narrow minded leaders of a particular state who are also heading regional political parties in India are using narrow thoughts to spread hatred against North Indians. It is not a type of work, labour or action but a simple trial to get the result or ‘fruit’ of power. Such people leave policies, principles & even humanity. They don’t hesitate to take decisions of the lowest level just to get the wicked motives. It is a matter of sorrow that in the state of Gujarat, the homeland of Gandhi, his principles & philosophy are being made mockery of. The proverb- “Nearer the Church, Farther from God” applies here. Gandhi was the first important political person in independent India person to be assassinated. Gandhi never took decisions on the basis of majority. He looked all the communities equally may be the Hindus, the Muslims, the Sikhs or the Christians or any other. His valuable wealth was his thoughts of peace, love, harmony, truth & non-violence. But the people, whose politics was based on communalism, perhaps didn’t like his policy of communal harmony. In the end, a fundamentalist Hindu shot him. But after his sacrifice, his thoughts became more popular. May be that, critics of that great soul are more in number in India but every visitor to India from a foreign country who may be a head of the country, pay a visit to Rajghat & pay obituary. Today, all over the world, where there are peace marches, all remember Gandhi. So there is no gainsaying that the thoughts of Gandhi are relevant even at present & would remain forever.